The chemical formula of Tigers eye -- SiO2 - indicates that this stone is a type of silica. Its hardness is 7 on the Mohs scale. Tiger's eye merges the vibration of the Earth with those of the Sun. This stone can offer support for new beginnings and helps in reestablishing the harmony of our lives. Tiger's eye protects the person who wears it, especially during long journeys. It also enhances the feelings of security and self-respect. 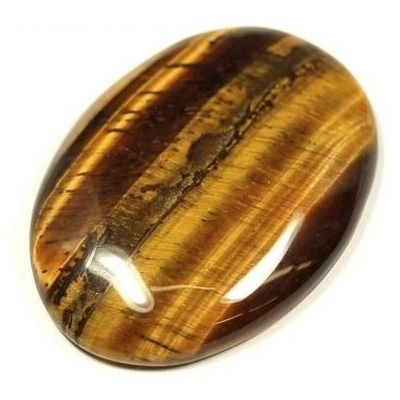 Tiger's eye is an excellent stone for increasing the power of personal will. It helps us acquire abundance and wealth and enhances the stability and balance that lead to maintaining the acquired wealth. This stone helps us fight the greed and misuse of power. Roman soldiers wore tiger’s eye in battle for protection. During that time, this stone was thought to bring clarity and deep insight about the current situation, instantly, here and now, therefore enabling the soldiers to see the truth at the battlefield clearly without deception. Especially suited for those seeking Serenity and Calm in their life. Career: Good for drivers, truckers, emergency workers, police, as it aids night vision and calms nerves. Metaphysical: Tiger's Eye makes me think of the qualities of the Tiger. Patient, focused, determined, alert, with perfect timing and slow, deliberate actions. This is Tiger Eyes gift to you. Excellent grounding stone! If you need to make some changes in your life, this is the stone for you! "New comers" (to recovery programs) , people who are easily distracted, adults with A.D.D. or who are Manic/Depressive, emotionally immature people, procrastinators, people in emotional turmoil, people in transitional states, NEED this stone, as it grounds them as soon as they are in its presence! Harmony: Tiger Eye helps to see both sides of any situation, and helps to bridge the gap that causes discord in work and family relationships.. Stress: If you feel nervous, anxious, or fearful much of the time, this is a great stone for you. Especially helpful if you're feeling drained, overwhelmed, confused, or unfocused. MONEY: This stone is best suited to earthy people. It has been used to stimulate wealth and abundance, and to enhance the stability required to maintain wealth and keep it without sub coming to wealth's "earthly temptations" of greed and abuse of power. Harmony: Creates order out of chaos. 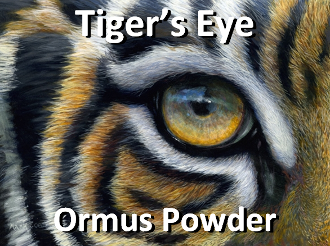 To make this into an Ormus Powder I took extra fine Tiger's Eye Crystal Powder and mixed it up with warm structured lightning water. Next I added Organic Dolomite Lime, filtered out the powder and preformed the John Hudson method. After 7 washes its now ready to in-joy. It had an extrememly large precip indicating that its full of Ormes.